With the Content Management System you have the ability to send an email blast, or Mass Email, to any of the groups that have been created in Contact Management and the SignUp Forms. For example, if you have created a SignUp Form and the Contact Group Name for the form is Group 1, when people sign up on that form, Content Management System stores their contact data in Contact Management under Group 1. You can now send a Mass Email to Group 1 without having to look up the email addresses of everyone who has signed up. It will automatically send the email out to each individual email address in that group. *Note: Due to browser limitations, the Mass Email feature is limited to only sending to a maximum of 400 contacts. If you are sending to more than 400 contacts at a time, you can use the Email Scheduler. To send a Mass Email, go to Site Management > Email Marketing > Send Mass Email. This brings up a window with a list of all your groups. Simply check the group(s) that you want to send to and click Continue. The next screen allows you to customize the email. First type the email address that you want to appear in the from portion of the email (1). The "To" space is simply to confirm who you are sending to. Type the Subject of your email (3), then choose the Message Type (4). Text allows you to send a plain text email to the group. HTML gives you a WYSIWYG editor so that you can edit the email with images, links, etc. It is very important to note that some email clients may not be able to read HTML formatted emails. For this reason, it is always a good idea to include a plain text version of the email. That is why we have provided the third option, Text and HTML. This sends the HTML email, unless unable, then it reverts to the plain text. If you know that everyone receiving this email has an HTML capable email client, then this is not necessary. 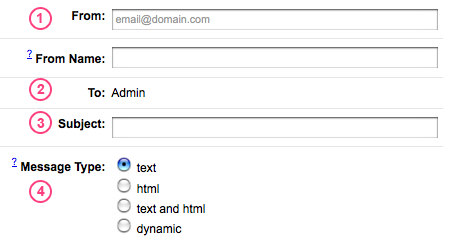 Lastly, you can choose to send a Dynamic Email. This feature is not available to all sites, but is standard for Custom and Church Fusion websites, and is an upgrade for Ministry Fusion, Youth Fusion, and Children Fusion. If you have multiple Dynamic Emails, then you may choose the one you wish to send. Otherwise the only option will be your Dynamic Email. You also have the option of typing a plain text email as mentioned above. Clicking Continue will show you an example of the email before you send it. To approve, click Confirm Send.